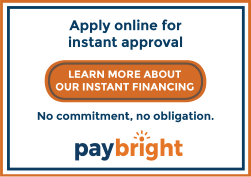 How do I setup the appointment? What actually happens when my pet is put to sleep? Will the procedure be painful for my pet? What are my options for aftercare? I am having a difficult time grieving my loss. What support resources are there? Over 80% of dogs and 70% of cats over the age of 3 have some degree of dental disease. Dental disease starts out as gingivitis and progresses to periodontal disease. 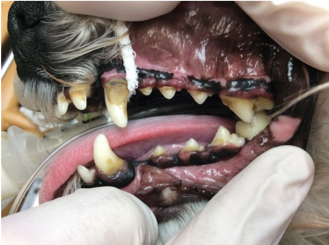 How Can I Avoid Dental Disease in My Pet? Once gingivitis has progressed to periodontal disease, the damage cannot be reversed, and a dental procedure required. However there are ways that we can reduce the progression of dental disease. Tooth Brushing: This is the number one way to reduce the progression of dental disease. 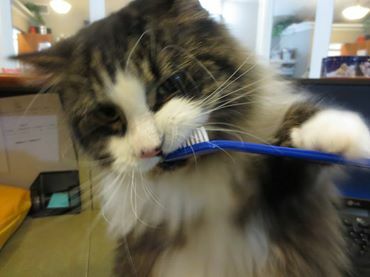 Brushing with a soft bristled or specially designed pet toothbrush and pet friendly toothpaste, is an excellent way to promote better dental health. It is important not to use human toothpaste because it contains fluoride. 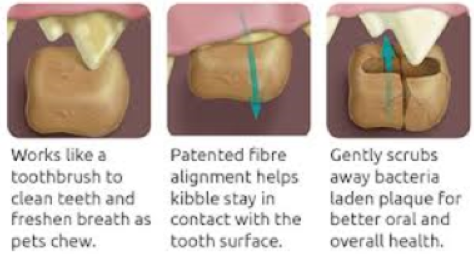 Dental Chews: The best kind of dental chew out there is one that can bend, is edible, and is effective at reducing the plaque and tartar on the teeth. Bones, antlers, and other hard dental chews aren’t recommended because they are too hard and can actually break the teeth. An example of a great dental chew is C.E.T. Enzymatic Dental Chews. They are formulated with a special antiseptic formula and that, combined with the natural abrasion on the rawhide, provides a proven method in reducing plaque and bad breath. Diet: There are dental health specific diets, such as Hill’s t/d diet. This diet is formulated into a specially designed kibble that won’t break right when your pet bites into it, but instead will scrub away the plaque. It has been proven to reduce plaque, tartar, gingivitis and staining on the teeth. Your pet will be admitted to the hospital the morning of the procedure, fasted from the night before. The veterinarian will perform an examination and review any bloodwork that was done. Then a sedative will be administered, which takes about 15-20 minutes to take effect. An IV catheter is then placed (which allows us direct access to your pet’s vein) and IV fluids are initiated. An intravenous anesthetic will be administered before beginning the gas anesthetic that he/she will be on for the duration of the dental procedure. We will start with a quick scaling of the surface of the tooth to remove any large pieces of calculus that will interfere with probing and charting the teeth. 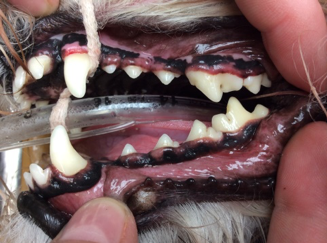 A probe is used to look for weaknesses in the tooth itself, periodontal pockets (where the gums and bone have recessed), furcations (where the roots of the teeth are evident), and record all their findings in your pets dental chart. If there are any extractions required, those will be performed by the veterinarian. Our highly trained staff will then completely scale all of the teeth, thus removing any and all tartar and calculus. After this scaling, we use a curette to go under the gum line and remove all subgingival calculus that contributes to bone loss. We then polish all of the teeth creating a smooth surface, thereby making it more difficult for plaque to adhere to the tooth. This is followed by an antibacterial oral rinse. Your pet is then closely monitored on his/her recovery from anesthesia, under the care of one of our highly trained staff, until he/she is able to go home safely. Why does it seem so expensive? Unfortunately our pets won’t just open their mouths and allow us unlimited access to their teeth. In order to remove the calculus under the gum line that contributes to bone loss, we need to have your pet under anesthesia. So a general anesthetic is necessary to be able to scale/polish/probe/curette the teeth properly. In order to administer anesthesia safely, we have to utilize proper monitoring equipment, trained staff, anesthetic machines, fluid pumps, warming devices and anesthetic medications. Any anesthetic has risks. We lessen these risks by doing preanesthetic bloodwork which looks at your pet’s internal organ function. This gives us an overall picture of their organ health. 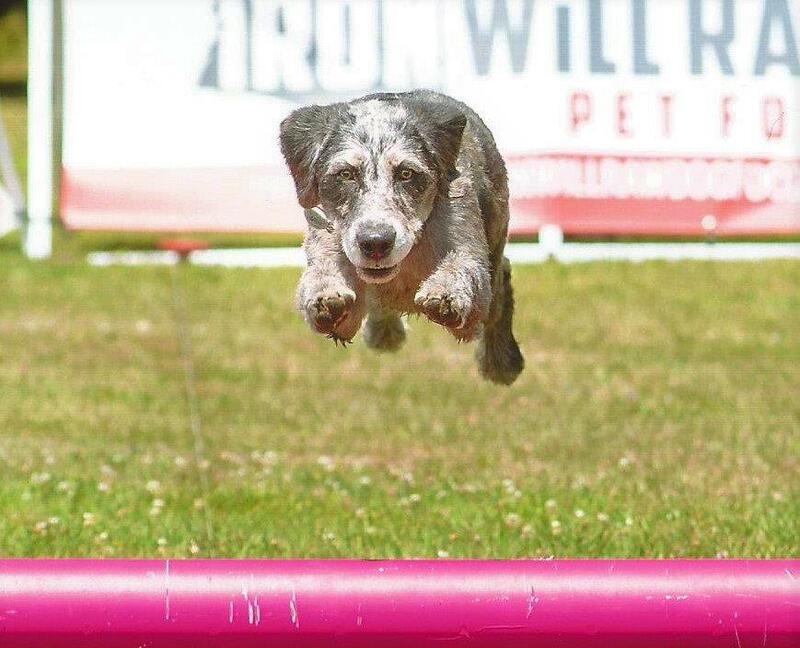 We also administer intravenous (IV) fluids to help maintain their blood pressure during the anesthetic, and help flush out the anesthetic afterwards, helping your pet have a smoother and faster recovery. Our staff are there to monitor your pet throughout their entire anesthetic, and during their recovery. Does my pet have to stay overnight? This procedure is a day procedure, which means that your pet will be discharged to you at the end of the day after he/she has recovered from her anesthetic. Do I have to feed him/her any differently? If there are teeth extracted, they will need softened/canned food for a few days. Afterwards they should be on a dental specific diet in order to promote better oral health. © 2019 Shannondale Pet Hospital.